Owning a quiet garage door opener will give you the satisfaction of effortlessly entering or leaving your garage. However, the best thing about a high-quality system is that your neighbors won’t complain about the noise. If you want quietness to be one of the features of your garage door opener, it may be a challenge to upgrade your old, current system. This article reviews the three best quiet garage door openers to help you pick the one you will be most satisfied with. When it’s dark outside, this belt drive garage door opener assures your safety. It syncs to your home’s interior and exterior lights and will automatically switch them on when you arrive home. The long-lasting battery life ensures the garage is still functional during power outages. A timer can be set that will automatically close your doors when you forget to. You’re able to control and monitor your garage door from your “MyQ technology” embedded Smartphone app. There will be no overexertion when lifting heavy doors thanks to the powerful motor. All HomeLink-compatible cars can be synced to this opener. The multi frequencies ensure you can operate the garage door from a distance. This garage door opener enhances your home security. Every time you use the remote a new code will be sent to you. The purpose of this is to prevent burglars from learning an existing code to access your garage. The PosiLock protection ensures once your garage doors are closed they will stay locked until you and the system give further commands. This white/off-white garage door opener weighs 37.2 lbs. It’s an ultra-quiet garage door opener and manufactured with a battery which lasts 20 hours. The long-lasting battery will not fail you during power outages. The motor will still respond to remote commands. The WD962KEV will constantly open and close your garage door smoothly and quietly. If you’re the one sleeping next to or above the garage, you’ll love the fact that there’s no noise to penetrate through the walls. Some cars have Homelink compatibility issues. You may need to buy an additional Homelink compatibility bridge. This 6.1 lb. quiet door opener has a 1/2 HP motor which makes lifting of heavy doors easy. The chain drive ensures smooth and quiet use. During thunderstorms, the motor can be struck by 200 watts of lighting and still be fully operational thereafter. The motor uses a compact fluorescent lamp (CFL). The multi-frequencies ensure there are no interceptions of other infrared devices. You can open and close the garage doors from a distance. MyQ technology is embedded in the motor. With the use of a smartphone app, you’re able to open, close and monitor your garage. Quiet garage door openers are the new trend to have installed in homes. With the latest technology in motors, you are guaranteed that no one will hear you coming or going. Advances in technology and mechanisms guarantee noise reduction in garage door operations. Chain drives are strong and durable. The older the chain drive model, the louder the operation. Modern innovations, however, have reduced the noise levels of chain drives. A drive screw opener directly engages with the motor. This type requires less maintenance and no lubrication. It provides the best power and speed. It’s mounted on your garage walls and directly attached to the torsion shaft. The torsion drive works by driving over the torsion shafts. Jackshaft garage door openers make use of torsion drive. DC motors provide added benefits in conjunction with working exceptionally well with the type of garage door opener. 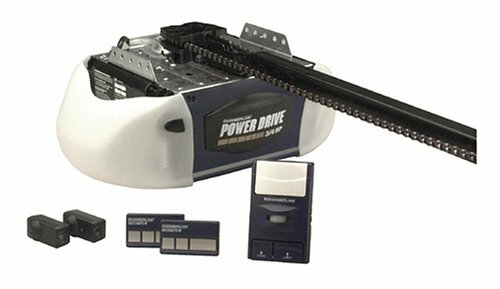 Each power level of garage door openers has different characteristics that are beneficial to the type of door and sizes of the door frame. 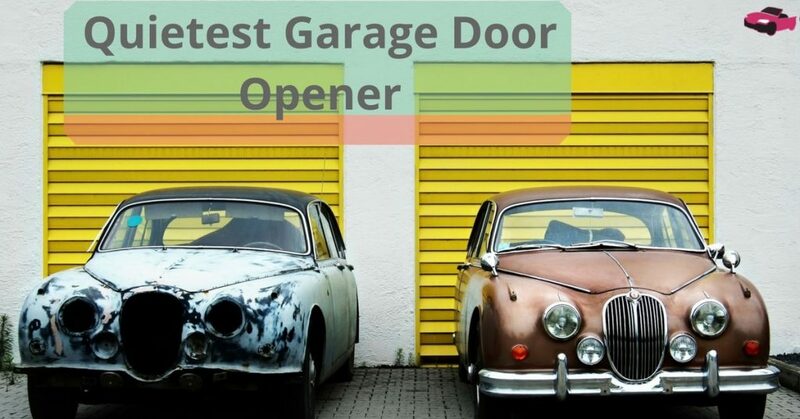 These fit into standard garage doors. They virtually lift any type of door. However, well insulated and 1-piece, wooden doors will put the strain on this model contributing to more wear and tear. These are best used for well insulated and one-piece wooden doors. They are more durable and can lift up heavier types of doors. These offer the maximum amount of power and is suitable for oversized or industrial doors. Lubrication is another technique used to provide additional smoothness and reduce noise. Lubricate rollers, bolts, and hinges. Through wear and tear, metal parts will begin to make a noise. By using oil on metal surfaces, you prevent the damage to the hardware. 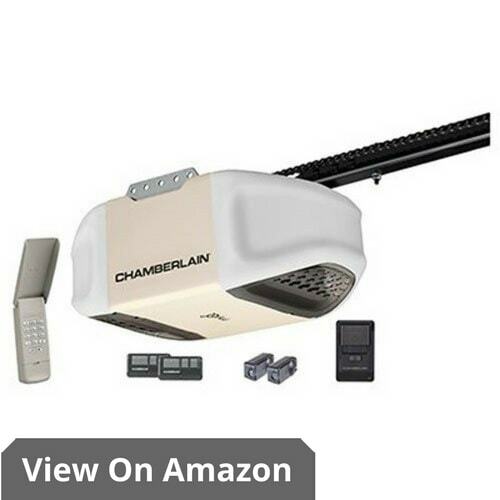 If you want a quiet garage door opener of the best quality, we recommend the model Chamberlain WD962KEV. 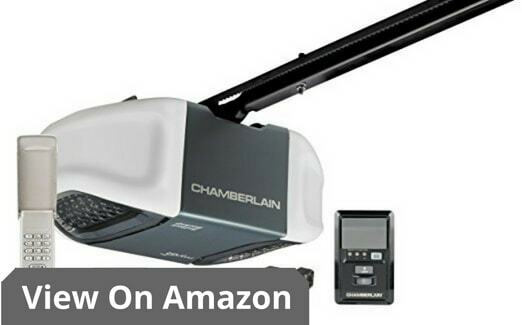 If you want a budget-friendly quiet garage door opener, the Chamberlain PD612EV is the answer. This garage door can withstand the 200W power of a lightning strike. The multi frequencies make controlling the doors easier, even from a distance. Installation is made easy as there is no need to install newer railings or sensors. You can install the garage door opener with the existing mountings. The MyQ technology also gives you the power of control. With the smartphone app, you can control the functioning of the doors and also monitor the garage. For added security, you will receive notifications whenever the doors are in use. The control remotes can easily be installed into HomeLink compatible cars. This shows how this Chamberlain product helps homeowners in every way imaginable.